There is no competition. Not here. Here, they co-exist. By the way, if ever you need a great field guide to help identify wildflowers, I would highly recommend Newcomb's Wildflower Guide, by Lawrence Newcomb. "Newcomb's Wildflower Guide: An Ingenious New Key System for Quick, Positive Field Identification of the Wildflowers, Flowering Shrubs and Vines of Northeastern and Northcentral." And speaking of identification, last week when these pretty white bell-shaped flowers appeared on a plant that my son had given me, I knew just where to find out what they were. I asked Judith! Yes, our Judith. There's no wrong place for flowers to grow together they belong everywhere! Hello JP, the lilies are a gorgeous color, lovely mosaic! And the wildflowers are very pretty. Judith has been a big help id-ing plants. Lovely post! Happy Monday, have a great new week! Beautiful lilies and wildflowers. And yes, they both belong... Happy Monday! Wild and cultivated definitely go together. Sometimes I'm surprised at what pops up in my garden, brought in by the wind or the birds. Beautiful flowers. Isn't Judith just a great source of knowledge? 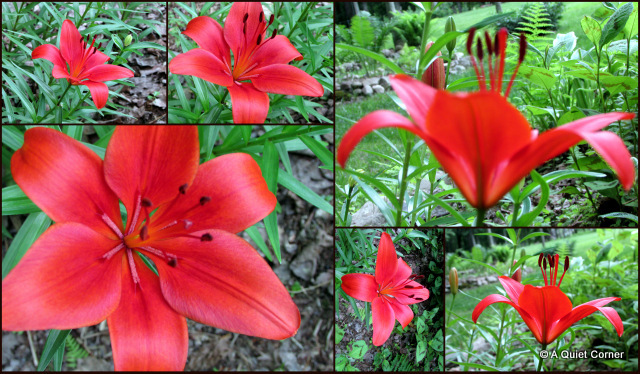 Isn't it great when we can coexist...I am just seeing red lilies popping up! Thanks for the Wildflower Guide recommendation. Both have their charm ... Lovely that they can co-exist side by side! cultivated or wild, I love them all. In the past if I wanted to know what a flower was I posted it on the blog. There's always someone out there who knows. beautiful, i love that bright orange color!!!!! I agree! I love all of it. In fact, I prefer the natural lawns to the chemically treated ones! So do critters. 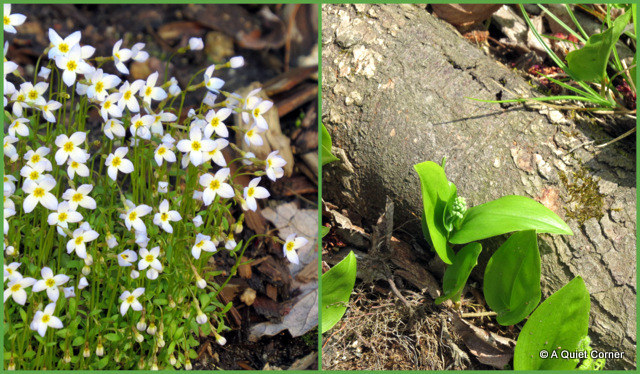 I would be lost without my Ontario Wildflower books and I also like the Forest Plant ID book. If all else fails, ask another gardener. :-) Glad I could be of help with your white bell flower. I have some red lilies. Very pretty!